Castellar del Vallès is a municipality o Catalonie in the comarca o Vallès Occidental. It is locatit 7 km frae Sabadell an 11 km frae Terrassa, the twa comarca's caipitals. Ither veelages near Castellar del Vallès are Sant Llorenç Savall, Matadepera an Sentmenat. The first evidence o human presence dates tae 7000 BCE, awtho thare is evidence o agricultural activity in the Neolithic, aroond 5000 BCE. The continuation o human presence is confirmit bi twintiet ane o funereal urns datit in the 7t hunderyear BCE, which wur locatit in the Plan o La Bruguera, in the municipal term wi shapit posterity, for a smaw necropolis o the age o the airn. In 2005, the remodellin o the centre o Castellar revealed airchaeological fynds that confirm the presence o a ceety o late Roman period, wi funereal rests, wi the agricultural activity, in 4t an 5t hunderyears, later substitutit bi a Visigothic dounset in the 6t an 13t hunderyears. A pairt o the oreeginal veelage o Castellar Vell, excavatit atween 1995 an 2001, dates tae the Carolingian period. A cemetery wis locatit here, wi 250 burials o 11t, 12t an 13t hunderyears. The fowk o the veelage hae been tradeetionally tee'd tae the marquises o Castellar, who in the present live in Barcelona. Durin 1968-2006, thare wur 181 forest fires or attempts at fires, affectin a aurie o 470.8 hectares. The lairgest fire durin this period teuk place in Julie 1983, an burned 75 hectares in the Auld Shoemaker region. Thare hae been 23 fires in the last 10 years, affectin 5.7. Thir are hintle smawer than the great forest fire o Sant Llorenç de Savall in August 2003, whaur 2,953.85 hectares burned. The lairgest snawfaws in this aurie came in 1962 an 2001, an thare wis a historical fluid in September 1962, which damaged the Tolrà factory in Can Barba, the brig ower the Brunet an in fermland near the Ripoll river. Tradeetionally the main economical soorce o Castellar del Vallès haes been agricultur. It is foondit in teepical Mediterranean growin (wine, olive tree, wheat, dree'd fruit an nuts) complemented bi products o the vegetable gairden. Linen an hemp hae been grown on the banks o the Ripoll river syne the Middle Ages. Frae the 19t hunderyear an unstoppable process o industrialization bein profitable, first manufacturin o the oo, efter cotton an lik this till the 20t hunderyear in that the industrial development keeps on convertin the land o growin intae biggit-up auries or industrial estates, leavin tae the agricultur lik residual economical activity. A true ivery time mair important tertiar sector, convertin the economy o Castellar intae the teepical ane o a post-industrial society. The industrial development o Castellar del Vallès haes been a lot jyned tae that o the textile company Tolrà, for the nummer o jobs as well as for the contreibutions o patronage o this toun. The toun coonts on twa industrial estates in whaur 5.000 bodiess (hielichtin the companies o the sector metallurgical an o the firth) wirk. Anither important sector is that o the services. Castellar haes twa main roads, the C-1415a, which jyns the toun tae Sentmenat an Matadepera, an the B-124, which connects Sabadell an Sant Llorenç Savall. At the moment thare are twa bus lines which serve the toun, Sagalés an Sarbus. 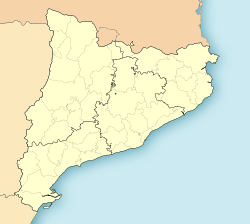 Castellar del Vallès haed a mayor o the Convergence an Union coalition (CiU) till 2007, even tho a coalition haed wan the first local elections syne the reestablishment o the democracy atween the Socialists' Pairty o Catalonie (PSC) an the Unifee'd Socialist Pairty o Catalonie. Durin the 1999-2003 legislatur an in spite o a absolute majority, Lluís Maria Corominas i Díaz arrivit at a pact wi the Republican Left o Catalonie (ERC) an PSC. The CIU pairty still govrens, despite its loss o majority in the elections o 2003. Dani Pedrosa, Motorcycle warld champion. José Eduardo González Navas, Catalan politeecian. Joan Blanquer i Penedès, Catalan filmmaker. Wikimedia Commons haes media relatit tae Castellar del Vallès.